Gaza: An unexpected player has come to Israel's aid in thwarting this year's Gaza-bound flotilla: Greece. It's a country Israel has been courting since a raid on last year's flotilla ended in the death of nine Turkish citizens, severely damaging relations between the Jewish state and one of its most important Mediterranean allies. Desperate for new friends in the region, Israel reached out to Greece, offering generous military assistance to the debt-ridden state. The fruits of that emerging friendship have been on display over the past week. First, Greek bureaucrats sought to delay the departure of the ships transporting activists and some aid meant to highlight the humanitarian effect of Israel's blockade on Gaza. When the US and Canadian boats finally departed, armed Greek commandos forced them back to shore. Now it appears the flotilla will be scaled down drastically. 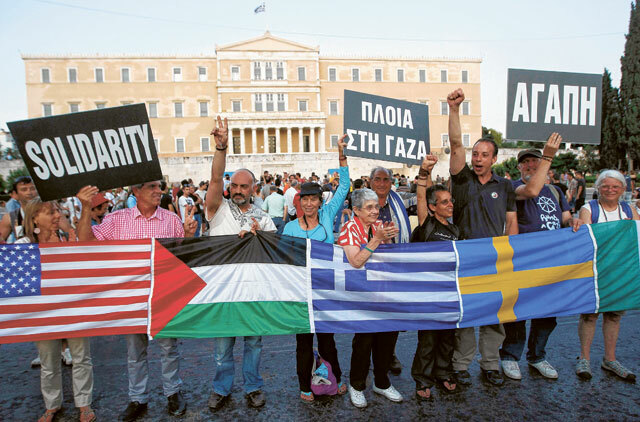 "There seems to be one thing that the [flotilla] organisers failed to take into account: Greece's attitude towards the flotilla, and the dramatic change that has occurred in Israeli-Greek relations in the past year," wrote Menachem Ganz in the Israeli daily newspaper Yediot Ahronot. The shift in Israeli-Greek relations began within months after an Israeli raid on the Mavi Marmara left nine Turkish activists dead. Greek Prime Minister George Papandreou paid a visit to Israel — the first in 18 years. Prime Minister Benjamin Netanyahu quickly followed up with a visit to Greece. While the Israeli and Turkish militaries halted joint exercises, Israeli and Greek air forces began training together, giving Israeli pilots added airspace for practice. "There's been intensive investment in ties with Greece since Israeli Turkey ties declined — especially in military ties,'' says Alon Liel, a former Israeli diplomat who was once posted in Turkey. Netanyahu recently thanked European leaders for discouraging the flotilla, and mentioned by name Papandreou — who then asked for help in obtaining tear gas to rein in protesters at home. The warmth in ties with Greece is one factor that has spurred recent talks between Israel and Turkey. Two weeks before Greece's flotilla clampdown, Turkish government officials also discouraged Turkish activists from participating. Turkish and Israeli negotiators are also reportedly finalising the details of a United Nations report on the flotilla, which is expected to include words of regret — if not apology — and some sort of compensation for Turkey. A Western diplomat based in occupied Jerusalem said: "Greece certainly cannot replace Turkey. It's bankrupt, with a smaller population, not as respected in Europe, its military is much smaller. But in the absence of Turkey, having warm relations with Greece is useful, and we are seeing that now."